FIFA world cup 2014 is all set for a grand kick off this Thursday at Brazil where the host team Brazil will start the first match of the tournament with Croatia. Football world cup, considered the biggest event in the World after the Olympics (ofcourse) will have series of group level matches starting from June 12 to July 13,2014 where the event will be concluded with the grand finale. 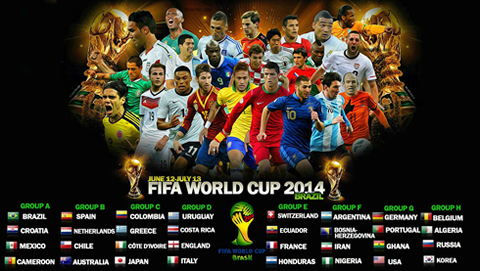 The FIFA World Cup 2014 will see a total of 64 matches which will be played in 12 cities across Brazil. For the first time ever, at a World Cup Final, the matches will use goal-line technology. So can reigning World Cup champions Spain defend the title? We’ll have to wait and find out. What team are you rooting for? Share with us your support for your favourite team by comment. Next: Comedy Nights with Kapil is ending this September!